While there is no easy way to achieve something, you can always come to your target weight through hard work and perseverance. There are many small things that you can always incorporate in your daily routine that can help you to achieve your goal of burning fat and becoming thin and slim. Start keeping count of the amount of calories that you consume in a day.Counting automatically allows you to reduce the amount of intake. Also, try and consume around 15 to 20% calories less than what your daily intake is. Shift to lower calorie foods such as granola bars or nuts and try to incorporate healthier calories, instead of unhealthy ones. Do not skip meals at all! 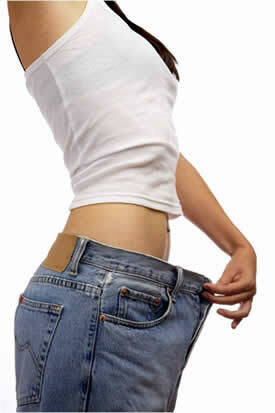 Skipping meals results in the body reserving more energy and converting it into fat. On the contrary, you should consume 5-6 small meals during the whole day. This results in your body using more energy to digest the smaller meals. One way to consume smaller meals would be get smaller portions or smaller plates. The best form of exercise that one should do to lose weight is cardio exercises; these exercises aim at increasing the heart rate which translates into burning more calories and fat. Cardio exercises can include dance, aerobics, swimming, running, jogging, etc. Exercise is an important means of losing weight and while a lot of people do not want to muscle strengthening or resistance training exercises that includes weight because they believe that it only adds on muscle, it is not true. Strengthening exercises can strengthen your muscles, which in turn helps burn more calories. Try exercises that can help strengthen and tone your muscles. Running is the easiest and the fastest way to lose weight. Running for long distances or at least 30-40 minutes in a day can result in losing a few pounds a month. In addition to helping burn fat, running also helps strengthening your lungs, muscles and even toning them. This form of training method has been proven very effecting for losing weight. It includes alternating between high bouts of intense exercising and low intensity exercise. So, it starts with warming up the body with a walk, then jogging to get the heart beating faster and then running at full speed to get the heart pumping and then back to jogging before cooling down into a walk. This form allows your body to burn more calories at a faster rate, than simply jogging or running or continuous movement. Drink nothing but water, no energy drinks, no sport drinks, sodas and alcoholic, juices, etc. Water comes with many benefits and should be consumed at intervals all throughout the day. However, be careful not to consume too much water. Replace any other form of drink with water and have water with every meal. White grains and dairy products add more calories to your system and burn up faster making you feel hungry in a couple of hours. This results in you reaching out for junk food or something to munch on. Cut back on these calories by shifting to brown rice, brown bread and skim milk. Fibrous foods are an important staple of our diet and can help you feeling full for longer periods, resulting in less munching on junk foods. They are also good for our digestive system and can help you lose weight a lot faster. These go without saying as vegetables have a lot of benefits including nutrients and vitamins. These are essential for the body to function. They are also high in fiber and can help you feel full for longer periods of time. They are also less likely to be converted into fat by the body. For people who have busy schedules and can never seem to find the time to work out, well try and incorporate small amounts of exercise whenever you can. Take the stairs at work, park your car far away from the elevators to incorporate more walking, walk and talk on the phone, add a set of crunches in between TV shows, etc. These small things can make a huge difference in the long run.